Operation Barbarossa, summer 1941. A coloured picture of a ferry made out of 8-tonne Brückengerät B (Bridge Equipment B). The vehicle is a turretless Beute Russian BA 10 armored car used as gun tractor. 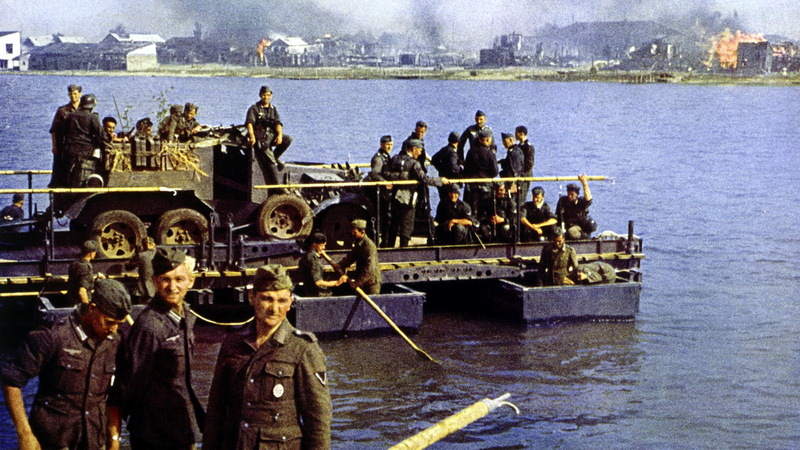 Bruckengerat B was one of the most commonly used German pontoon. A motorized Bridge Column B was equipped with trucks and halftrack prime-movers for towing trailers with pontoons, decking, ramps, wooden planks, and motorboats. 16 steel half-pontoons used either paired or singly allowed the assembly of a bridge either of 8 tons capacity and 83m (274ft) long, or bearing 16 tons and 54m (178ft) long. The deck sections had steel stringers, and curb guards with 26 wooden planks. There were eight trestle sections consisting of roadway decking supported by adjustable steel posts, each with three bracing legs. These allowed ramps to connect to the floating bridge when the bank was higher than the bridge’s roadway, or when the water near the banks was too shallow to float pontoons; they also allowed ramp-angle adjustment as the river rose and fell. Several types of ferries could also be constructed, and a trailer was provided with cable reels which could pull these back and forth. A halfpontoon was 12ft long and 5ft wide, and a ferry capable of carrying 4 tons required two half-pontoons and one bridge deck section. An 8-ton double ferry used four half-pontoons and two deck sections, and 16-ton ferries used two full pontoons and two deck sections. The full-pontoon bridge and the 16-ton ferry could in fact support any vehicle and equipment found in the infantry or early-war armored infantry division, to include a Panzer IV tank or a 15cm howitzer and its halftrack prime-mover. This picture was first published in the book "Das Heer im Grossdeutschen Freiheitskampf" (The Army in the Greater German Battle for Liberty) as issued for the German youth by the Oberkommando des Heeres (OKH) in Berlin, printed by Förster und Borries in Zwickau, Germany in about 1942.